The Bud: These square-lensed '80s-esque jobs come in nine style combos (striped zebrawood w/ polarized lenses, ebony w/ indigo flavor...), and were inspired by their trucker grandfather who allegedly once wrestled a cougar with his bare hands, though he probably could have thrown Kim Cattrall in a half nelson even while wearing gloves. The Bird: Avail with a variety of lenses in frames from zebrawood to (panda-friendly!) 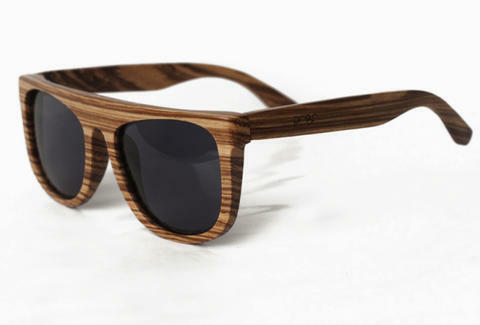 bamboo, the Bird resembles Wayfarers modded with a thick eyebrow-esque bridge. According to Proof, "It's like if you were to walk into a quiet library full of people and shout, 'BAM-TADOW-BOOM I'M IN THE BUILDING'! That's what wearing the Birds is like"
They've also got a few colorful snapbacks, plus a handful of graphic tees including some emblazoned with the simple phrase "Proof", something Joe Francis was kind enough to videotape enough of to get himself locked up.